The earliest Pashtun comers to Attock were the Lodis who accompanied Mahmud Ghaznavi as mercenaries on his invasion of India. In the late 11th century Dilazak tribe of Afghans had possession of all the plain of Peshawar, and extended even to Chhuchh-Hazara and the Jhelum.. In 1541, Sher Shah, having driven the Emperor Humayun from India, led an expedition against Ghakkars who sided with Humayun.Sher Shah threatened to construct such a fort in that country that it should not only effectually restrain the Ghakkars, but also the passage of the Mughals. He therefore himself made a tour through the hills of Girjhak Nlnduna [mountains circumjacent],‘ and finding a fit spot, he laid the foundations of the fort, which he called Rohtas. Besides that, he sent a large force against Rai Sérang, the Ghakkar, and not only was the country subdued, and the hill of Balna'th plundered, which was then the residence of the Darogha of that tract, but the daughter of its chief was taken prisoner, and conducted before Sher Shah, who presented her to Khawas Khan; upon which Rai Sérang, they relate, sent a quantity of [hemp] blankets and millet to Sher Shah, with the remark that in such only consisted their raiment and food, besides which they could afford nothing; according to others, he sent a lion’s skin and some [arrows] spears, which he said was their only property. With this conduct, however, Sher Shah was by no means satisfied. Sarang [Sarang’s troops] being weakened by [skirmishes] the attacks of“ the holy warriors, and greatly reduced and straitened, submitted himself in person to Sher Shah, who ordered him to be flayed alive, and his skin to be filled with straw, and so pay the penalty of his misdeeds. 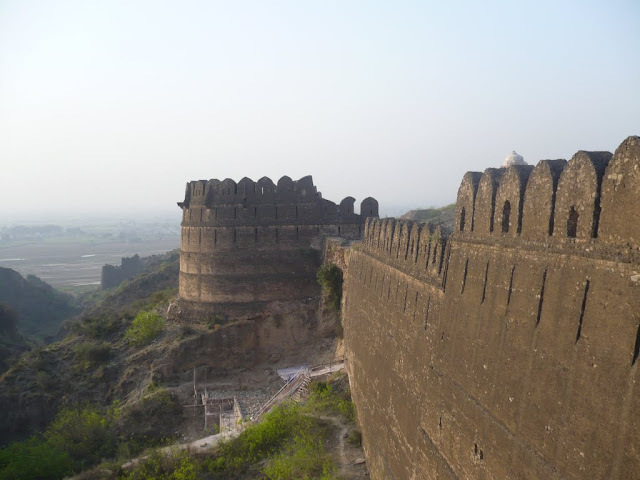 Sher Shah issued farmans to complete the fortifications of Rohtas ; but Todar Khatri represented that the Ghakkars, to whom that country belonged, would not allow any one to work for wages; and that they had agreed amongst themselves, upon oath, to expatriate every person that should contravene their wishes. Sher Shah, in answer, told him [that he should noways be allowed to give up that work, which he only wished to do in consequence of his greediness for gold] that the work did not seem to advance under his superintendence, and that a man who was fond of money, and was alarmed about disbursing it, would never accomplish the king’s designs. Todar, on the reception of this fresh command, fixed first a golden ashrafi as the enormous remuneration for one stone, which induced the Ghakkars to flock to him in such numbers that afterwards a stone was paid with a rupee, and this pay gradually fell to five tankas, till the fortress was completed." Ghakkars were subjects of Afghan Lodhi Sultans and remained peaceful till the time of invasion of Babur. This is also verified by Babur who records in his tuzk-i-baburi, "Tatar Ghakkar had waited on Daulat khan and was in a certain way subject to him"
Awans, Ghakkars and other Hindki tribes of Potohar and Salt range were subject to, or owned allegiance to Khan Kaju (or Gaju), the chief of Yusufzais. The authority of Khan Gaju was recognized from Nek-Anhar to the Margalah pass. And from the Lahori Kotel and upper Swat to to Gahep; and Adam, the chief of Gakhars, acknowledged his sway in one direction , while the Kafirs acknowledged it in the other, and from Pakhli and Dharamtaurs to Kalabagh. The Ain-e-Akbari, containing a complete and detailed survey of the empire of Akbar Badshah was completed in 1596-97 AD. At that time the Northern half of the Sindh-Sagar Doaba constituted the Sind-Sagar Sarakar, so called, of the Subah or province of the Punjab or lahore. The Sind-Sagar sarkar contained forty-two mahals or parganas or districts, one of which was Khushab on the Jehlum, the inhabitants of which were Isa Khel and other Niazi Afghans, who paid 1,80,704 dams of revenue , and who are rated as able to furnish 500 horse and 3,000 foot for militia purposes. In 1587 AD, an expedition was sent under the command of Abdul Muttalib Khan , son of Shah Budagh, and other commanders to root out Jalala and Roshnias from Bangash. When the troops reached the Sind near Sunbulah , Zanagaey Khan , and other of the Niazi Afghans, who dwelt in that neighborhood, joined the Badshah officers with their contingents; and they crossed the Sind at Chauparah Ferry , and entered into the lands of Isa Khel. Firoz Khan, Jamal Khan, Ali Khan and other Niazi chiefs of that part , also came and presented themselves before the Badshah’s commander. When the Khattaks ,under Malik Ako, began to push northwards and eastwards towards the Shakar Darah, the Awans of Bagh – by which name , and Bagh of the Awans, the Khattaks style Kala or Kara Bagh – as soon as they became aware of their movements , concluding that they had designs upon their districts, made an attack on them , and many were killed on either side. The Khattaks however were not checked in their movements, and they took possession of (what was subsequently called) the Khwarah and Sunialah. The Khattaks after this waged war with many of the surrounding tribes , and among them were the Awans of Suhan-Sakesara, whom they didn’t consider nit necessary to “conciliate”. They crossed the Indus into Sind-Sagar Doabah , ravaged and wasted the country round Sakesera, and took both males and females captive; indeed 40,000 Awans more or less fell into captivity. Such is Khushal Khan Khattak’s account of his tribe’s invasion of Awan’s territory, in his grandfather’s time. Kalabagh was formerly known as Kara-Bagh. The Hindi translation for Kara, the Turkish for black, etc, is Kala. Kalabagh as well as great part of western Punjab was held by Turks before the period of accession of Lodi dynasty, as Babur badshah likewise mentions. As the Turks became weak, the Afghan tribes began to appropriate large tracts of country towards the Indus. When Niazi Afghans had been nearly annihilated in 16th century, the Hindkis (Awans etc) around began to raise their heads , and to follow the example of Afghans. After Dhankot of the Niazis had been swept away by river Indus, one of the head men of the Awan tribe of Hindkis, who appear to have been vassals of the Niazis, took up his residence and built for himself a dwelling on the spot where Kalabagh now stands, which site must, evidently, have previously borne the same name. By a dehree, a town sprung up around , which on account of its favorable position , and nearness to the salt mines, went on increasing.